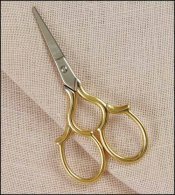 Tudor Embroidery Scissors with Gold Handles  - $12.90 : Yarn Tree, Your wholesale source for cross stitch supplies. Item 2142. Tudor Embroidery Scissors with Gold Handles. Soft curves and decorative finger holes define these lovely embroidery scissors. 3¾" long with sharp points that cut to the tips.